What Does an Art Gallery Assistant Do? An art gallery assistant works full time in an art gallery, typically helping the director operate the art gallery like a small business. The art gallery assistant helps with the promotion of the gallery’s exhibitions and may be in charge of updating the gallery’s website and promoting the exhibitions via various types of social media. Unlike a small business, the art gallery deals in art, so the art gallery assistant also helps with shipping and handling of artworks, plus communicating with artists and collectors. If the gallery attends art fairs, the assistant will also work with the director to create the gallery’s press kit and art handling. An art gallery assistant salary varies based on the level of experience, geographical location, and other factors. Art gallery assistants may be able to excel in the job without an advanced degree if they have prior, relevant experience. Education: Many art galleries require their entry-level staff to have at least a Bachelor’s degree in art or art history. However, work experience and proven gallery sales, in lieu of a college degree, are often acceptable. Training: Many of the daily tasks are administrative in nature, and training typically takes place on the job. Communication: A gallery assistant needs great interpersonal skills, and should be an excellent communicator with the ability to talk to a wide range of people without being flustered or intimidated. Project-oriented skills: The individual must be able to multitask on both short- and long-term projects. Social media skills: A gallery assistant needs to be savvy with social media and proficient with commonly used computer programs. Initiative-taking skills: Being able to work independently and to take the initiative with projects is also key. According to the U.S. Bureau of Labor Statistics, the outlook for employees in the gallery curator and archivist fields (which includes gallery assistants) over the next decade relative to other occupations and industries is strong, driven by the public's continued interest in art, which should increase the demand for curators, art dealers, and the collections they manage. Employment is expected to grow by about 13% over the next ten years, which is faster growth than the average for all occupations between 2016 and 2026. This growth rate compares to the projected 7 percent growth for all occupations. Many jobs in the visual arts do not rely so much on personal appearance, as many of these jobs are "behind the scenes," such as working as art handlers, art critics, museum registrars, and artists. Art gallery jobs differ because an art gallery assistant is often sitting at the front desk of the gallery and is the first person the public sees. A polished and professional appearance is vital. Men often wear suits and ties, while women dress in a sophisticated style, with fashionable hairstyles and makeup. Even though the gallery's represented artists may dress creatively or eccentrically, it is not common to see gallery staff do so. Art gallery assistants typically may work either full-time or part-time hours and could work nights or weekends, depending on when the gallery stays open. In tourist-heavy areas, galleries may stay open during the evening and on the weekend. 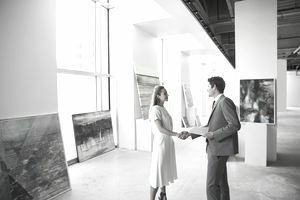 Art galleries are in the business of selling art, and since presentation is so important in sales, the gallery staff needs to be highly polished, as their appearance reflects on the identity of the gallery. Keep this in mind when applying for a gallery assistant position. Before the interview, be sure to visit the gallery to see what type of dress code they have and dress accordingly for the job interview. Many students and aspiring artists will work in an art gallery to gain experience in the art world and to learn more about the business of selling art. Many positions are available on a volunteer or intern basis. Some gallery assistants will work for leading galleries, and after several years will open up their own galleries. Find these positions by searching online job sites, or use VolunteerMatch.org.